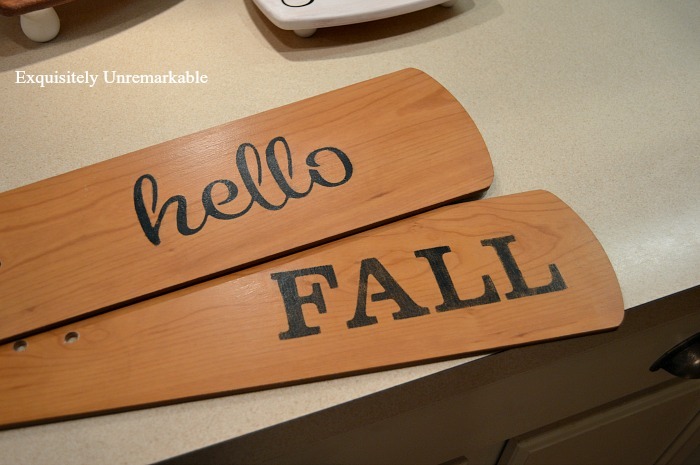 Whip up a cute set of door tags for your fall front door with ceiling fan blades. They're the perfect size and no need to sand or stain. Last year, while I was checking out Pinterest for something fabulous to put on my fall front door, I came across pins for the cutest wooden tags. Of course, I fell in love immediately and knew that they'd be a perfect way to add some charm to my entryway, but alas woodworking is not an easy DIY. Since I am a lazy crafter and my idea of a power tool is my glue gun, I quickly abandoned that idea and made a wreath instead. Well, lucky me, this year, my sweet neighbors offered me a few ceiling fan blades and I knew I was back in business. You may remember that last year I had a great time painting ceiling fan blades for Halloween and Christmas. I have since been letting the world know, if you have blades, I will take them. 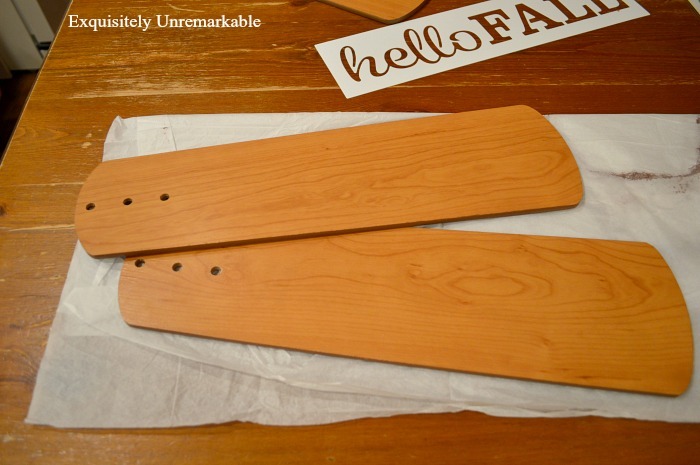 The ceiling fan blades were the exact shape and size I needed to make the tags and they were already finished in a wood tone. 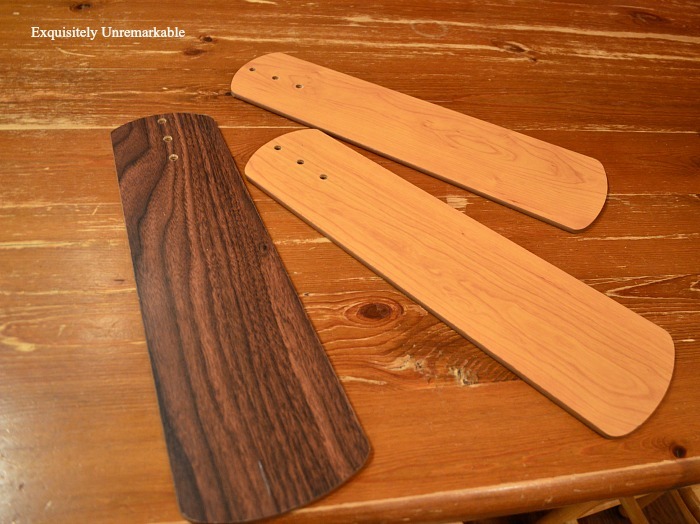 No woodworking or staining skills required. They also had predrilled holes to loop them together and hang them up. All I needed to do was decide on a phase and start painting. Now, I have to be honest, I hate painting letters. I usually use wall stickers and cheat my way to beautiful. This time however, I couldn't find a wall sticker with the phrase I was looking for and the individual sticky letters I bought did not have an H.
No joke, people. There was no H in the whole pack. That's ok, the craft store had this neat stencil. I didn't have to wrestle with individual letters, spacing them out, worrying about overlapping them and dry time. Plus it was on sale, less than $3 after all the discounts. I just wiped my blades down and got to work. Before I started to paint, I played with the blade placement. I wanted them to hang a certain way and wanted the words in a specific position, so I mapped it out. When the paint was mostly dry, I carefully lifted the stencil straight up and away from the blade. Then I moved to the other blade and repeated the process. 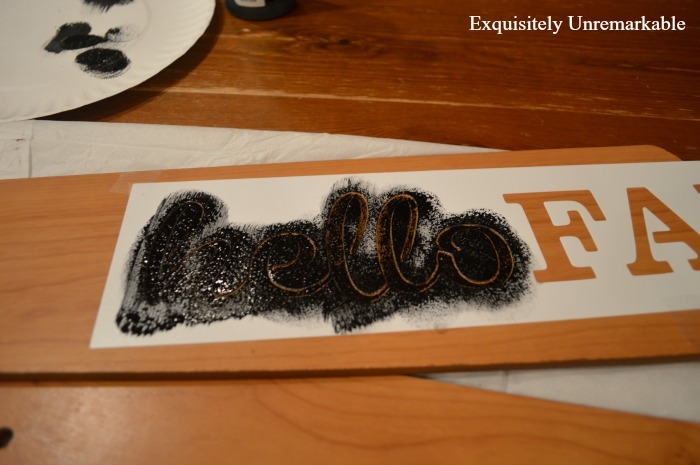 When both words were totally and completely dry, I coated the blades with decoupage gel to seal them. hello, because fall would hang behind it. Once the stenciling, sealing and gluing was done, I laced the blades together, in the predrilled holes, with a little twine and added a fabric bow. A perfect way to welcome fall. They look great with the rest of fall decor in the living room. I got the tags I have always wanted without the woodworking skills that I don't possess. And it only cost me three bucks. Very clever... I need to be on the lookout for fan blades now! You are so clever! Love this! Great idea, my friend. I love it!!!!!!!! What a cute project and a great way to upcycle fan blades! Thanks so much, Paula! I had fun making them, too...easy. That is so cute. Now to find and old fan. Very crafty and clever. Love this Kim. 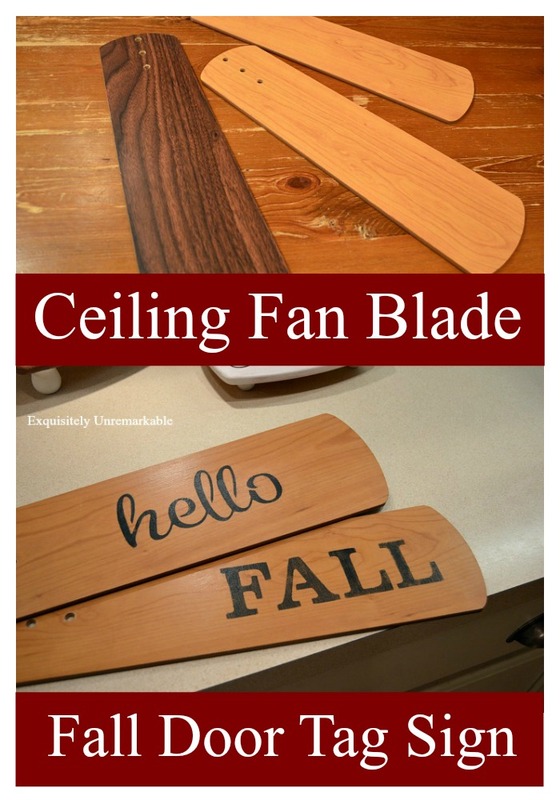 What a great way to re love old ceiling fan blades. Thanks Kris! Makes me wish I had saved the three fans in the bedrooms we put in and then tossed several years later. Who knew? Great project and it looks very cute too! nice upcycle! Thanks so much, Heather! It was a fun and simple one to create! Thank you! Even yhough I do possess the tools and skills to make these from raw wood, I'm replacing my ceiling fans, so I have tons of blades! Looks lime it's time to get to work using that pack of 26 stencils I got at WallyWorld for $10 last year. 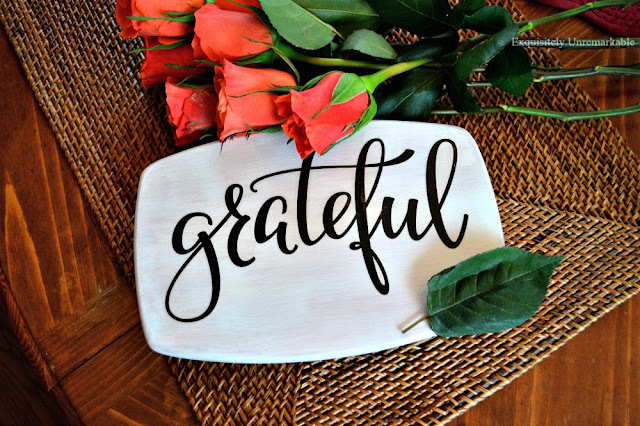 You are the sweetest and I bet you will create some fabulous signs with our stencils! Keep us posted! This is really pretty Kim! 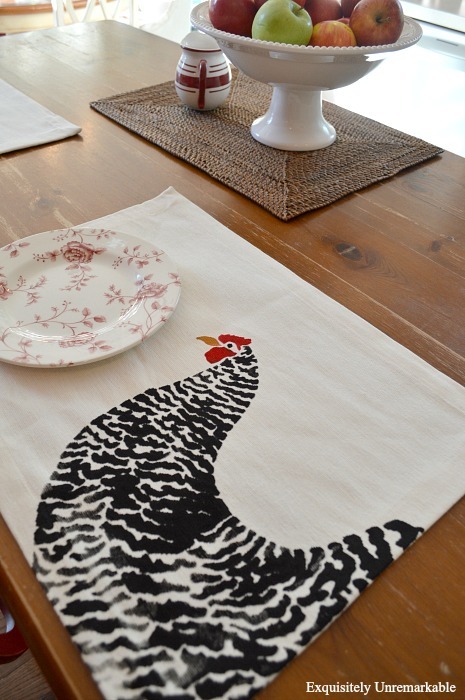 You are just so creative in re-purposing things to make them look oh-so-pretty again! Thanks Vel! I really wanted a set of those tags and the fan blades made it easy! How brilliant is this....I love it! Love them! Very unique and one of a kind. You have inspired me to "cheat" so I bought some sticker words at the $1 store today....I am hooked! So easy! Aww, that's as cute as can be! Great tip about gluing the blades together! 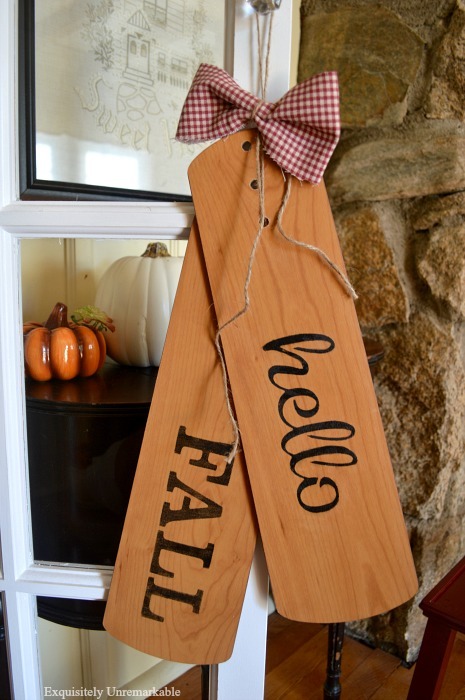 So cute for your door, and I bet your neighbor is pleased you made such cute use of the blades. I've actually been thinking about making them their own set! Seriously, Kim, I just want to live in your head for a day or so just to figure out how the hell you think of these things? Super cute idea!! I know the front door tags you were talking about. I really like these ones especially with using leftover fans and not needing to cut out a stencil. They look wonderful. It was an easy way out, Leanna! I'm so glad you like them. Thanks for the visit! Another wonderful idea. I love repurposing fan blades. These are great. Thanks so much, Debra! Sometimes those wonderful ideas come in waves...or on garbage night! ha! Perfect! I love this idea. I also think an Etsy Shop would be a fun idea. ;-) Another item I would like to buy. Thanks Lorri!! It was easy. Perfect for this lazy crafter. The hand-painted ones were a lot of fun to make. I have a few tucked aside to do again this year! And thanks! Thanks Cindy! It was super easy to do and they were the right shape for this lazy girl. Have a great week! And thank you for the super sweet comments, Barbara! You just made my day! Thanks Maria....I love getting pinned! This is super cute! Also, love all your other projects too! Oh gosh...these are TOO CUTE!! I will pop on over and share! Thanks Jess! What a fun idea! Great stencil, too! Thanks Cecilia! I got lucky with that stencil. I hate working with individual letters. I always made a mess. Thanks Pamela! I thought it would be an easy way to get the look I wanted. Thanks for the visit! Hi Kim, what a cute sign you made out the ceiling fans. You are always coming up with unique and creative ideas. Thanks too for the sweet comment and visit to my blog. Thanks for the party Julie! There’s always lots of pretty. Enjoy the weather! You are a clever one . . .
Who would think . . .
CEILING FAN . . . Thanks Lynne! This was a fun one to make and they were perfect shape. Win...win! Thank you so much, Sandra! I appreciate the kind words. Clever, cute and cheap. Works for me! :D Hugs. Wow wow wow! This is an incredibly easy project, thank you for the inspiration! So glad you like it Marilyn! It's an easy one and there is no cutting involved! My kind of project! These are super cute, and look so easy to make. My kind of project. I saved some fan blades a while back, and have been looking for them over the last few days to make some Halloween projects. But can't seem to remember where I put them. LOL. Love the use of the fan blades. I will keep my eyes out for some when I am thrifting! I found some at the curb on garbage night, too, Vickie...keep your eyes peeled...and thanks for the visit and the kind words!